The Portuguese Gastronomic Week, taking place until March 16, is showcasing an array of authentic Portuguese dishes at Four Seasons Doha and a musical performance by award-winning fado musician Maria Ana Bobone at the Qatar National Convention Centre (QNCC). Speaking to reporters at a reception on Monday, Portuguese ambassador Antonio Tanger Correa said the event will witness internationally renowned chef Miguel Castro Silva presenting some of the popular Portuguese dishes in Doha. 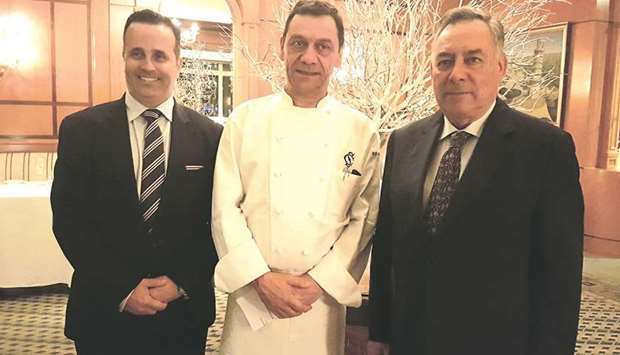 “It has been a goal, an objective here for us to bring the Portuguese cuisine to Qatar, as you know the Portuguese cuisine is well known, a very distinct one and we brought one of the most famous chefs in Portugal,” the envoy noted. “Silva is not only a chef, he has seven restaurants of his own and someone who really knows deeply the Portuguese cuisine,” he added. Some of Silva’s specially-designed menu are reflective of Portugal’s traditional fare of fresh seafood and infused with his signature modern twist. The chef’s exquisite seven-course menu includes smoked mackerel on vegetables; almond vichyssoise with smoked duck; seabass with orange and fennel; codfish in pil pil, potato, onion and egg; slow braised rib with dry tomato risotto, sheep cheese mousse, cassis sorbet; and sponge cake with lemon curd. Meanwhile, Bobone, together with the Qatar Philharmonic Orchestra, will be performing “Fado, the Songs of Portugal” at QNCC on March 17. Fado is globally recognised as a symbol of Portuguese culture and tradition. The concert, sponsored by the Portuguese embassy in Doha and Qatar Airways, will be conducted by Manuel Rebelo, who founded the international culture club “Emotion Arts.” He completed his Masters Degree in Conducting in 2009. Bobone will also be performing at the hotel tomorrow (Thursday) evening as part of the event.